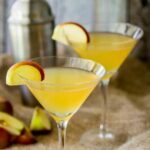 This Caramel Apple Martini is the perfect fall cocktail. Starting with a vodka base and then adding the warming and comforting flavors of caramel, toffee and butterscotch together with apple cider, you can create an autumn drink that is fun, easy to make for two or you can make up big batches if you are serving a crowd for a party. (You can also call this a Toffee Apple Martini). Pour the schnapps, vodka and apple juice into a cocktail shaker with plenty of ice and shake well. Strain into martini glasses and serve with an apple slice garnish.